It’s a beautiful, blue-sky Sunday in London and yet a whole host of us are gladly descending into the cosy autumnal warmth offered by Pizza Express Jazz Club in Soho. What would tempt us away from the final throes of this year’s sunshine? The chance to hear London-based pianist, singer and composer Joy Ellis marking the launch of her new album. 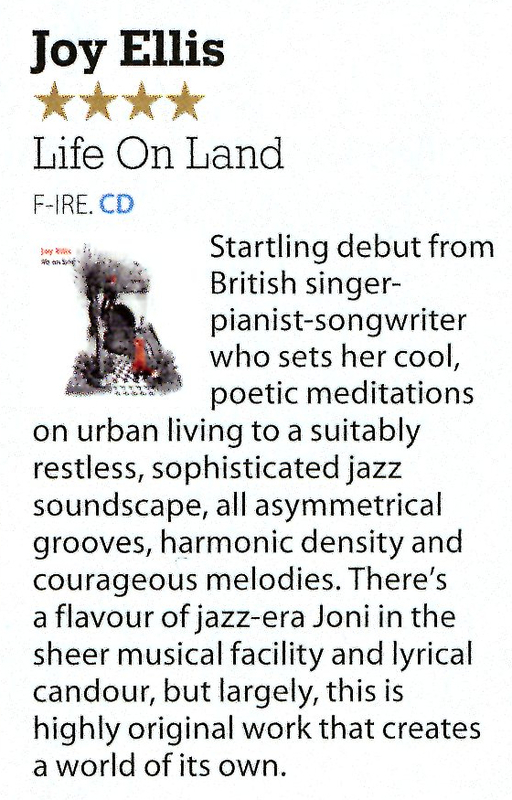 Ellis’s album Life on Land will officially launch on 11 November and is her first album of fully original compositions, which have been inspired in part by the “colourful, hectic and sometimes lonely nature of the capital”. The line up was slightly different for the launch from the recording itself, with Joy Ellis on vocals and piano, Adam Osmianski on drums, Gene Taylor on double bass (instead of Henrik Jensen) and Billy Adamson on guitar (in place of Rob Luft). There were also special guests Rachael Cohen on alto sax (more than capably stepping into Binker Golding’s tenor sax shoes) and James Copus on flugelhorn. Before starting the gig, Ellis mentioned — whilst clinging for dear life to a hot drink in the way that only singers would empathise with — that she’s been battling a sore throat. She needn’t have worried, any slight loss of vocal strength or in-between-tunes coughing certainly didn’t detract from the performance. Her immediately-recognisable rich tones shone through from the opening notes of From Dusk Till Dawn, which is also the opening track of the album. The whole was nicely tied together by a distinctive sound, which very much explored traditional jazz harmonies whilst offering something fresh and contemporary. There was also a pleasing variety of styles and energies within that, ranging from the powerful and rhythmic The Jazz Man (in which Cohen played a fantastic solo) to — a personal favourite — the beautifully soft and calm Here in the Quiet. Not to be overlooked, as can sometimes happen with singers who are also instrumentalists, was Ellis’s accomplished playing. The piano was by no means a simple accompaniment, with some excellent soloing and interesting chord and harmony choices throughout. All musicians were quite faultless and special mention should perhaps go to Adamson on guitar who, along with the piano, was really given space to shine. There were a couple of purely instrumental tunes, the standout being the album’s title track Life on Land, which gave another layer to the variety of the gig and also the opportunity to fully appreciate the talents of James Copus on flugelhorn, whose playing was effortless and energetic. Ellis’s presence on stage is also easy, with a musical energy and intensity that is interspersed with comfortable chat and her trademark grin. This natural and unassuming character makes the level of talent and musicianship all the more welcome and enjoyable. A great gig and album that is sure to mark just the beginning of a new phase in Joy Ellis’s career. Yesterday, an old friend of mine said on the telephone that “jazz is dead”. Not any old person, but a guy who knows more about jazz and big band music than I ever could. He is a bit of an authority on the subject as a respected writer, author, photographer, former drummer and one-time gig promoter. I was a little taken aback by his blunt comment, but we didn’t have time to fully pursue the debate. Since then, I have been mulling over what he said and need to go back and say, ‘Oi, what did you mean by that’? In the meantime, I wade through the piles of CDs I have here to review, and find this one. Genre: Jazz. Artist: Singer Joy Ellis. Surprisingly for such an accomplished and joined up (don’t you just hate that trendy phrase!) album, this is Joy’s debut release. London-based pianist, singer and composer Joy delivers 11 cuts here, ably supported by some fabulously talented players. I mean that sincerely and literally. My eyebrows went up when I heard the mad skillz on piano (Joy), on guitar (Rob Luft), on double bass (Henrick Jensen) and on drums (Adam Osmianski). Plus guests James Copus on flugelhorn on two tracks and tenor sax on two from Binker Golding. Joy wrote and produced all the material here, recorded in London in May and June last year (2016), a year in the making in total. Joy plays Rhodes electric piano and acoustic piano here and sings all vocals. She drew inspiration from photographs she took of her surroundings in Haringey, London for the compositions on this debut album. Especially the abundance of street art. Joy bundles up memories of cultural diversity, hectic tempo of life in the big smoke, the city’s colours, harshness and loneliness. From the grand architecture to the atmospheric neighbourhoods. There is a palpable chemistry between Joy and her colleagues across this impressive album. Balanced, measured but unshackled performances where you feel this is just the tip of the iceberg as regards the innate talent on display, the gloriously laid back feel, the seamless flow of the tracks sat snugly side by side. The sheer spirit and love of this music is there for all to hear. The solos are joyous and free, nothing is over cooked. This is a true meeting of minds. It is pretty apt for me, that Joy chose the date of Sunday 5th November to launch this record with a gig at Pizza Express in London, as part of a 12 date UK tour. The date, synonymous with fireworks, spectacle and lots of colour. This is a record that lights up the room. Her voice is not easy to compare. But the likes of Carol Kenyon, Polly Gibbons, Jill Saward (of Shakatak fame), Cleo Laine and on one track, “Here In The Quiet,” Annie Lennox’s timbre popped its head up into my point of reference. I also was reminded of the superb Pepi Lemer, the singer with the great 1970s UK jazz fusion band Turning Point, who didn’t sing lyrics, but used “vocalese” to make a really lovely sound. Joy has that quirky phrasing thing going on, that will keep any band on its toes. Her tone, vocal abilities and her ease also put me in mind of Ella at times, where Ms Fitzgerald could replicate the tone of an instrument like trumpet or sax and match its phrasing. Joy Ellis has a distinctive voice of her own though. But, her piano skills are fantastic. A real find as a pianist, for sure. She has Zoe Rahman’s classical touch, and I heard shades of Keith Jarrett and McCoy Tuner in her playing. A very gifted player indeed. A triple threat with those pipes of hers, those fingers and her songwriting assets. Joy studied piano from a young age, and began to find her voice to sing later on. She did a Masters in Performance at Guildhall in vocals. She is most definitely not a singer who accompanies herself on piano. Joy Ellis has a gift on two instruments. Piano and voice. Got it? Guitarist Rob Luft is a monster player. There’s a lot going on in those fingers of his, and I’d bet his record collection is vast and varied; and takes in the likes of Pat Metheny, Al Casey (the jazz player not the session player), Charlie Christian and Jim Mullen et al. I have singled out Joy and Rob as sparkling stars here, but that is not to take anything at all away from the incredible work from drummer Adam and bassist Henrik. They play a blinder behind Joy, and add massive value across these 11 tracks. A rock solid rhythm section that even a professional fracking team couldn’t crack! The big thing for me is how understated and so damn natural everything is. The material is a pretty even listen, some of the songs form a slightly better vehicle for her voice than others perhaps, but it is all of a good standard. Not going to cherry pick standouts – a matter of personal taste. I particularly liked the tracks that featured more piano, and then the cuts with Rob’s fretboard skills to the front. The flugel horn solos on two tracks are magnificent from James Copus, one to watch. Binker Golding’s tenor sax solos on “The Jazzman” and “Ellington Said” are both outstanding work. He of the amazing Binker & Golding duo. Joy was recently one of 14 emerging artists to be chosen to take part in the Artistic Director series with Mercury Prize nominated singer ESKA. Joy has also been singing and playing live with the Brazilian band Samba Azul. On “Life On Land,” Ms Ellis doesn’t reinvent the wheel, nor does she stray too far from traditional jazz flavours, but she does inject contemporary sparkle to give her c;assy ‘thang’ a bit of an edge. This is the sound of a woman and an artist who knows her own mind and exactly how she needs to express herself. Not chasing trends, not trying to be too clever. On future recording projects, she can afford to experiment and fuse different stuff together. But on her debut, there’s a strong core sound all the way through this very impressive calling card. So my old mate Mr Kilv….Jazz is dead is it? Tell that to Joy Ellis, Rob Luft, Henrik Jensen, Adam Osmianski, James Copus and Binker Golding. Oh, and me! You’re dead wrong mate! Joy Ellis (voice/piano/rhodes/compositions); Rob Luft (guitar); Henrik Jensen (bass); Adam Osmianski (drums) + James Copus (flugel on tks 4 & 10); Binker Golding (tenor on tks 2 & 8). Ellis, a London based singer, makes an impressive debut with this F-IRE Presents album finding inspiration for her compositions from her native Haringey via photos, street art, architecture and London in general. The cultural diversity, the hectic tempo, the harshness, the loneliness, the neighbourhoods. I suppose we all could find similar inspiration in our own hometown but, with the possible exception of New York, nowhere in such varied abundance as in our capital city. Russell actually previewed the album back in May when Ellis appeared at the Jazz Café. However, this is the finished product and it's the biz. The voice is appealing, it's not a Summertime or Funny Valentine voice, although I'm sure it could and can be when the gig demands it, rather it's a storytelling voice and, though Norma Winstone, Annie Ross and Shirley Horn are fleetingly suggested, Ellis is none of these. She's her own woman. Rob Luft continues to make an impact on the guitar scene with solos that add a shaft of light to the sometimes sombre surrounds. Jensen and Osmianski give the essential support as do the Special Guests! Special indeed! I'd intended to hold fire on this release for a couple of days but, coming on the back of last night's gig by Binker and Moses at Gosforth, I felt it was right to draw attention to Binker's presence on a couple of tracks. The Jazzman sees Binker living the title role with his extended solo whilst, on Ellington Said, he blows another long one that many tenor players would have had to live to be a hundred to match. Copus adds his distinctive flugel sound to a couple of tracks - I wished he'd been on more. Where can I hear this lady? Well, it just so happens that on Sunday, October 29 Joy Ellis is at the Empty Shop in Durham, on Tuesday, November 14, Joy is at The Fox in Hexham! Then, on Saturday, November 18, she's at The Old Fire Station in Carlisle! As for the actual CD Launch, that takes place on November 5 (easy date to remember) at Pizza Express down in Soho.